It’s late fall in northern Colorado and the Big Thompson River is a gray waterway meandering through the spacious meadow. An overhang of ochre grasses forms an elegant border that channels the slow-moving stream. At its lowest level this time of year, the cold creek reveals a wide range of fantastically-shaped rocks. The blue forest in the background fringes the gateway of jagged spires and conceals the river's mysterious source. Named Moraine Park, this ancient landscape was formed by mighty glaciers thousands of years ago. 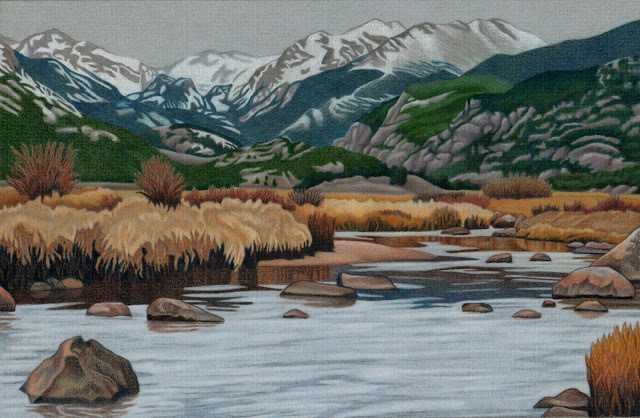 Today, the spectacular valley is enclosed by snowy peaks and it’s the centerpiece of Rocky Mountain National Park. Autumn is a favorite time of year as it provides a pleasant distraction while waiting for the cold season to return. In this drawing, the bright colors are gone and the white sky is a ominous indicator of an approaching winter storm. Thanks Claudine, it's one of my favorite places in Colorado. A really lovely painting Dan and I always enjoy your thoughtful observations. Appreciation of nature is ,I hope, a universal language. Thanks so much, I enjoy wandering around out here taking pictures and trying to create drawings that express my love for the Colorado landscape.